Former Bermuda Program intern Maia Patterson McGuire has worked as a Sea Grant extension agent in Florida since 2001. She was recently honored with a professional achievement award for her work developing the Florida Microplastic Awareness Project, which encourages citizens to look for microplastics in Florida coastal waters. In 1988, at the age of 20, Maia Patterson McGuire took a break from her usual summer job of working at the Bermuda Aquarium, Museum, and Zoo (BAMZ) to accept an internship with BIOS’s Bermuda Program, a move that would change her career trajectory. Through this opportunity, available for Bermudian students, she conducted research with Robbie Smith, now the curator of the Natural History Museum at BAMZ. At the time, he was an adjunct faculty member at BIOS—a position he still holds—in the process of conducting research on coral reef ecology for his doctoral degree. Less than five years later, McGuire pursued her own doctoral work focusing on coral reef ecology and reproduction from the University of Miami. This led to a postdoctoral position at the Harbor Branch Oceanographic Institute. 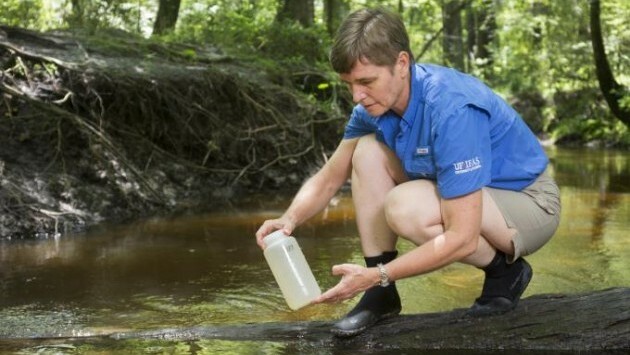 For the last 17 years, she has worked for Florida Sea Grant through the University of Florida as an extension agent for two northern coastal counties. In August of last year, McGuire, 50, received a professional achievement award for her work developing and implementing the Florida Microplastic Awareness Project. This citizen-science project is aimed at identifying microplastic pollution in Florida’s waterways. Have you always been interested in science? Do you remember what first sparked this interest? McGuire: When I was about 7 years old, my parents took me to see Jack Lightbourn’s extensive collection of shells. This is the same collection that is currently on exhibit at the Bermuda Underwater Exploration Institute (BUEI). But, at the time, it was in his house. I was fascinated that he had found all of these shells on the beach or by going out with trap fishermen and collecting the shells from hermit crabs that had crawled into the traps. This inspired me to start my own shell collection. My father would wake up early with me on weekend mornings to go search the beaches along North Shore and South Shore. We would spend hours looking for shells, collecting them with tweezers and putting them in empty film canisters. Then we would go home and identify them. 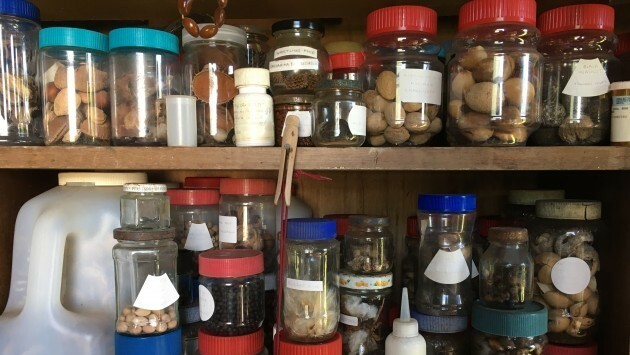 Part of McGuire's original shell collection, which she amassed over years of beach-combing with her father, is still housed in a shed in the backyard of the family's home in Bailey's Bay. A few years later, the assistant curator at the aquarium called and asked if he could come see our shell collection. I was invited to the aquarium holiday party that year and Richard Winchell [who was running the aquarium at the time, now the head of the Bermuda Zoological Society] said that I could come work over the Christmas break; I was 12 at the time. I worked weekends cleaning tanks and taking care of the animals for four years, until I left the island to go to college. You are one of 150 people who have participated with the Bermuda Program since 1976. Describe your experience. Taking part in the program was pivotal for me in deciding what I was going to do in graduate school. Part of Robbie’s dissertation tried to figure out why corals weren’t growing back on an area off North Shore where a ship had grounded. We spent the summer investigating one of the theories: that hermit crabs or snails were eating young coral larvae. Conducting these laboratory experiments was what first got me interested in coral reproduction. I thought it was so cool that you could bring corals into the lab, collect their larvae, and then put the adult corals back out into the field. At the time, it was exciting to be able to contribute to dissertation research as an undergraduate. Were there any memorable lessons from your time at BIOS? My work with Robbie led to me look for graduate advisors who worked on coral reproduction, which led me to the University of Miami. I ended up doing my dissertation there and publishing a paper on the reproductive timing of mustard hill coral, Porites astreoides, and mapping out what triggers their annual onset of reproduction in Florida. We already knew about the timing of reproduction in Bermuda, from Robbie’s work, and in Puerto Rico, but Florida was still a gap in our understanding. I think I was probably in a unique situation compared to other Bermuda Program interns at the time, as I’d been playing around with small-scale research projects prior to my internship. I also knew a lot of people at BIOS, either from working at the aquarium or through my parents, who were both educators. What are the most challenging and rewarding aspects of your current job as a Sea Grant extension agent? The most challenging part, which isn’t necessarily a negative for me, is that I can’t predict what my day, week, or month might be like. I’m usually juggling a lot of projects at once and I have to be able to respond to what’s happening in the community. My time is often spent figuring out how to deal with this, but I seem to thrive on being pulled in different directions. It also means that I’m ready for new opportunities when they arise; for example, my colleague and I just wrote a book, “One in a Thousand: Those Amazing Sea Turtles” because we realized there was no age-appropriate book that could be used to accompany our fifth grade curriculum on sea turtles. The most rewarding part is hearing back from kids or adults that have participated in one of my education programs. They will say, “I never realized this” or “I started doing that.” I enjoy knowing they took the information I gave them and shared it with someone or used it to make a difference. What advice do you have for young people who are interested in pursuing a job in science? The advice I always give is to look for opportunities and take advantage of them, especially volunteer opportunities. I was incredibly lucky to grow up in Bermuda and have the opportunity to work at the aquarium. This gave me advantages in applying for schools and scholarships. Volunteering also helps you figure out what your interests are before you get into school and start down a degree path. Even if it’s not exactly what you want to do, something close still helps teach you. Also, don’t lock yourself into something too early and decide it’s the only thing worth learning. Go explore different things and try new experiences.